I started using StumbleUpon last year and it’s been a pretty decent source of traffic for my site. I use the StumbleUpon toolbar and am always stumbling other blog posts that I enjoy. Here’s what my StumbleUpon traffic has been for February- I am working on seeing what works well and what doesn’t. If you aren’t on StumbleUpon yet, I would definitely recommend checking it out. I’ve prepared a list of resources that will help get you set up and give you more information about how to effectively use StumbleUpon. 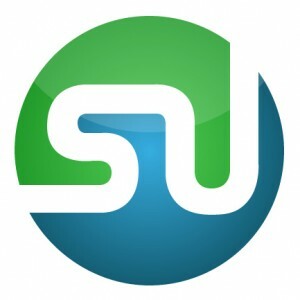 Are you already using StumbleUpon? How do you find it in terms of bring traffic to your blog? Thanks so much for this post! You explained it so well! Thank You! I’ve been meaning to check out StumbleUpon more thoroughly – when I first signed up I was a little overwhelmed and confused! This is a huge help. I signed up for it a bit back, I still am a bit overwhelmed and confused lol. BUT this helps a great deal thanks!!!!! I am just a citizen stumbler–one of those people who will go to sleep after just one more stumble! What I’d like is a short tutorial on how I can promote my favorite blogs through stumbleupon. Click the thumbs up? Suggestions on labels? What else do I need to know? Yes when you see a post you like you just click the “I Like It” with the thumbs up. As for labels, I look for the best category that applies. If the post is about Facebook, I choose the Facebook category. If its a blogging post, I choose Weblogs category. If its about kids I choose Family/Parenting. I guess just use your best judgement as to which one you think best applies to that particular post. I just joined! Here’s to more traffic!!!! Great post. I love using my stumble upon toolbar and stumble almost every night after i am done with my blog posts and visiting other fun blogs! Thanks Stacie :)I also just stumbled this post! thanks for including my post in the list. Not sure if yours is a WP blog, I haven’t received a trackback, but I am sure glad I managed to see it and say thank you. I love StumbleUpon and I can say that it is a great tool. Today was in fact my most visited day since I started the blog and I had about 1.000 visits from StumbleUpon alone. So go for it and use SU, follow people and Stumble all the cool things you see there. My blog is on WordPress – I am glad you still found my post though! That’s awesome about SU! I hope that I can get the same results you’ve had someday too! I am on stumbleupon but dont think I am using it the right way. Cant wait to read your posts. Thanks so much. I never took the time to try to understand it. I just added the “stumble” badge to the top of my posts on my blog and added the firefox toolbar. Dumb question here – so do you stumble your own posts to get them “out there”? Yes you can BUT make sure you aren’t just stumbling your own posts. The majority of your stumbles should be other peoples posts with a little bit of your own sprinkled in. Good for you for adding the SU button! I have the toolbar also and when I like a post I always stumble it. Make sure to do a review if you are the first person to stumble- very important. Pingback: StumbleUpon 4 U Blog Hop - Oh My Gosh Beck! | Oh My Gosh Beck! Thanks for the post I really needed this info! Okay ~ here is what I cannot find and need to know. Perhaps you can help me? If I Stumble a post, how do I find the link to that post. For instance, when you tweet something, you right click on the time for the direct link. That is what I need to know. Any help would be great!